Mainstream health science has let you down. Weight loss is not the key to health, diet and exercise are not effective weight-loss strategies and fatness is not a death sentence. You've heard it before: there's a global health crisis, and, unless we make some changes, we're in trouble. That much is true--but the epidemic is NOT obesity. The real crisis lies in the toxic stigma placed on certain bodies and the impact of living with inequality--not the numbers on a scale. In a mad dash to shrink our bodies, many of us get so caught up in searching for the perfect diet, exercise program, or surgical technique that we lose sight of our original goal: improved health and well-being. Popular methods for weight loss don't get us there and lead many people to feel like failures when they can't match unattainable body standards. It's time for a cease-fire in the war against obesity. 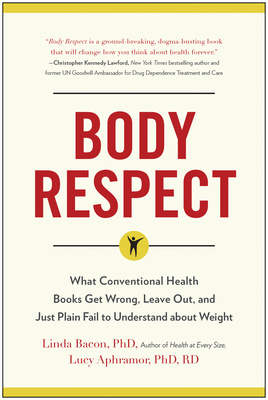 Dr. Linda Bacon and Dr. Lucy Aphramor's Body Respect debunks common myths about weight, including the misconceptions that BMI can accurately measure health, that fatness necessarily leads to disease, and that dieting will improve health. They also help make sense of how poverty and oppression--such as racism, homophobia, and classism--affect life opportunity, self-worth, and even influence metabolism. Linda Bacon, Ph.D., is an internationally recognized authority on topics related to nutrition, weight, and health. A nutrition professor and researcher, she holds graduate degrees in physiology, psychology, and exercise metabolism, with a specialty in nutrition. She has conducted federally funded studies on diet and health, and is well-published in top scientific journals. Linda's advocacy for Health at Every Size(R) has generated a large following on social media, health and nutrition listservs and specialty blogs, and the international lecture circuit. She and her work are quoted regularly in national and international publications, with recent appearances in the New York Times, London's Sunday Times, ABC Nightly News with Diane Sawyer, Good Morning America, and magazines including Prevention, Glamour, Cooking Light, Newsweek, Fitness Magazine, and National Geographic. Well known for her hard-hitting political and social commentary, Linda writes a regular column on the Health at Every Size blog and frequently guest posts elsewhere. Her first book, Health at Every Size: The Surprising Truth About Your Weight was called the "Bible" of the alternative health movement by Prevention Magazine. Lucy Aphramor, Ph.D., R.D., notably pioneered the use of a health at every size approach in the U.K. National Health Service, developing an eight-week HAES course that is now available internationally through licensed facilitators. She is director of a consultancy dedicated to advancing health at every size theory and practice in and beyond the U.K. through training, research, and community engagement. Dr. Aphramor is also an honorary research fellow at Glyndwr University, Wales, and a visiting lecturer in nutrition and dietetics at Surrey University. Dr. Aphramor is the only U.K. dietitian with publishing and teaching expertise in critical weight science. She is at the forefront of the new international Critical Dietetics movement where her work blending critical thinking and compassionate self-care is enthusiastically received. Her influence extends to coverage in the popular press and her reputation as an outspoken scientist gains her interviews across the board from women's magazines to the broadsheets.